BALTIMORE - Nearly 2,000 people attended a concert tonight by country music superstar Tim McGraw to support patients and programs at the University of Maryland Children’s Hospital (UMCH). 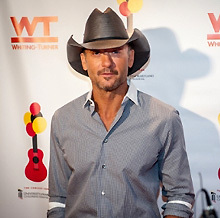 McGraw, a Grammy-winning artist who has sold 40 million records worldwide, performed signature favorites including his inspirational chart-topping “Live Like You Were Dying” at the benefit concert at the Joseph Meyerhoff Symphony Hall. Before the show, McGraw visited with several patients at UMCH and their families. To support the patients and programs at the University of Maryland Children's Hospital, please click here. To read the full news story, click here.